In the lush green countryside in the heart of a valley which lies between Lake Como and Lake Lugano, at an altitude of 850 metres and at only one hour’s distance from Milan, stands the Villa Simplicitas – a large nineteenth century residence. Renovated in 1981, the Villa has been transformed into a quaint hotel, surrounded by meadows and centuries-old chestnut trees. 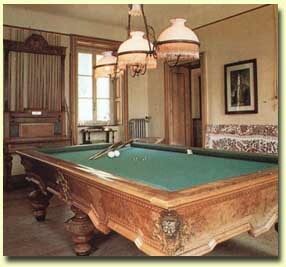 The sitting-room, with a large open-fireplace and a billiard room with a billiard table which dates back to when the house was built, are on the ground floor: the ten guest rooms have confortable wrought iron and brass beds and bedsteads and antique furniture. The restaurant is also situated on the ground floor on a terrace with a spectacular panoramic view, illuminated in the gentle summer evenings by candlelight. 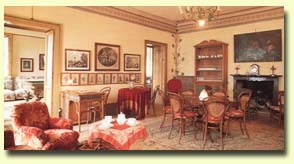 The international cuisine includes also typical dishes and specialities from Lombardy. To enjoy the peace and tranquillity of the countryside, rambling around the fields and in the surrounding woods are a favourite pastime of our guests. Golf and tennis facilities are in the vicinity. Nearby horse lovers are also catered for with long rides in the woods and lessons for the less experienced. Due to the altitude and abundant vegetation, even during the warmest months of July and August, the evening brings a pleasant temperature which, together with silence, incredibly facilitates deep slumber. Our guest are from all over as well as Italian people who appreciate the rare amenities that the Villa Simplicitas is able to provide. Opening of restaurant in low season not always coincides with opening of the hotel.